A monument commemorates the centenary of the Hume and Hovell expedition which passed through the area in 1824. Hume & Hovell Centenary. 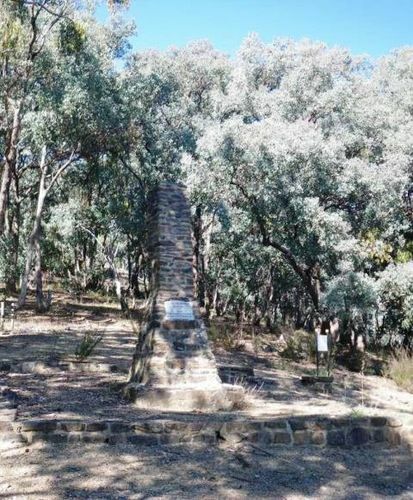 The following programme has been adopted for the ceremonies along the explorers` route from Melbourne to Albury:-Saturday, November I5, leave Melbourne for Wangaratta: Nov. 16, leave Wangaratta for Chalet, Mount Buffalo, and unveil tablet at The Horn: November 17, leave Mount Buffalo and unveil memorial at Myrtleford, 11.30 a.m, at Everton 2.30- p.m., Murmungee 4 p.m., Stanley 6 p.m., reaching Beechworth the same night; November l8, unveil memorial at Back Creek, Beechworth, 10 a.m., at Allan's Flat at 11.15 a.m., at Staghorn Flat 12.15 p.m., Ebden at 2 p.m., Bethanga 3.30 p.m., reaching Wodonga and Albury the same day; on November 19 the party will attend the Albury ceremonies, and the first party will leave for Wangaratta.